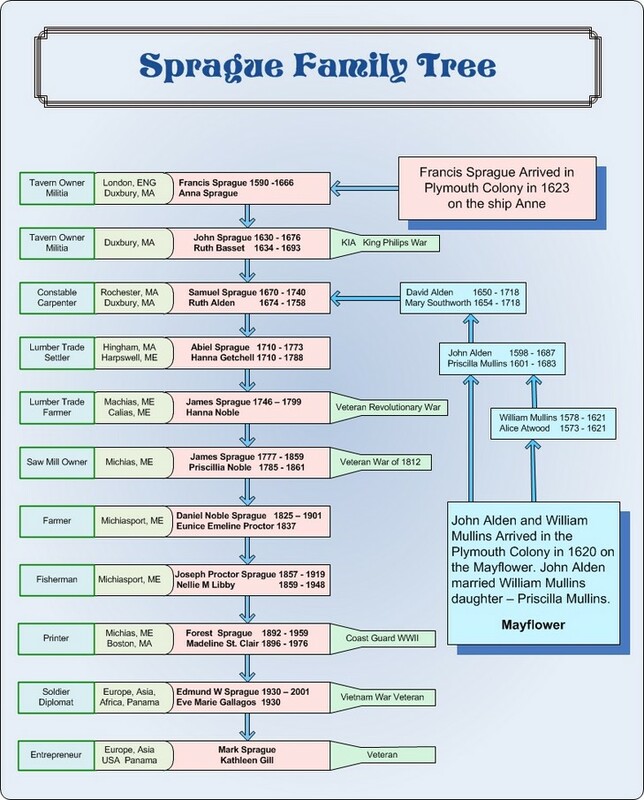 History (extracted from the book Founding Fathers of America) – 12 generations back the first Sprague came to the new world to settle in the Plymouth Colony in 1623. I’m proud to have a great grandfather who exhibited such independent thought and behavior. In the fall of 1623, Francis Sprague and his family participated in a harvest feast that also turned into a celebration of the marriage of Governor William Bradford to Alice Southworth. This feast, which was attended by the local Indian chief Massasoit and 120 of his people, was the occasion that has since become noted as the first Thanksgiving. On 5 November 1623, Francis Sprague took part in what may well have been one of the first “volunteer” fire fighting efforts to have taken place in New England. On that evening a fire broke out in one of the settlement houses that soon spread to and destroyed two or three other houses and threatened to engulf the storehouse where the settlement’s winter food supply was being kept. Governor Bradford organized the fire fighting effort and the food stores were saved. It was later discovered that the fire had resulted from a deliberate act of arson. That Francis Sprague was of such independence of mind as to balk at such official interference with the process of free trade is indicated by the fact that within next year his liquor license was suspended for his “…drinking overmuch and tolerating too much jollity” and was admonished for purposely and knowing serving guests beyond the legal limit. That suspension was lifted though by the end of 1638. On 5 June 1666 Francis Sprague’s liquor license was again suspended because of a brawling incident in his tavern. This suspension was also temporary, being lifted a short time later.